Synopsis (from the publisher): Emma Rayburn was born and raised in Baron Hollow, North Carolina, and it was a quiet life. Then came the accident … and the nightmares — each filled with unshakable visions of darkness, blind panic, and desperate women chased toward inevitable death. With no reports of local women missing or found dead, Emma has written it off to troubled imaginings — night after dreaded night. Until her sister arrives. 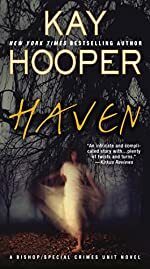 Even with the help of Noah Bishop, head of the FBI Special Crimes Unit and co-founder of Haven, Jessie and Emma soon find themselves outnumbered by the secrets buried in Baron Hollow — and outrunning an evil that has been festering for years, one that’s targeting Jessie and Emma one last time.